“The developer … assured Mr. Graham [a leaseholder] and his wife they would not hear anything louder than the sound of a refrigerator 900 feet away, he said. Instead, the noise makes the windows on his house rattle and he hears some turbines a mile away in his living room. ‘They never intended for us to have the peace and quiet they promised,’ he said…. [They] told stories of neighbors and residents who have difficulties because of seizure disorders, or developed anxiety attacks, learning disorders or other ailments after the turbines started turning. CLAYTON – “At times, it is almost unbearable.”Cohocton Wind Farm leaseholder Hal E. Graham told north country residents Wednesday night about the noise and other effects the 50-turbine wind farm has had on his and his neighbors’ lives. Mr. Graham has one turbine on his property, 2,000 feet from his house. A neighbor has one 1,050 feet away from Mr. Graham’s house. The developer, First Wind, Newton, Mass., assured Mr. Graham and his wife they would not hear anything louder than the sound of a refrigerator 900 feet away, he said. Instead, the noise makes the windows on his house rattle and he hears some turbines a mile away in his living room. On the walk to his mailbox, it can reach nearly 100 decibels. “They never intended for us to have the peace and quiet they promised,” he said. Mr. Graham was joined by fellow panelists Gail Kenney, a nonparticipating resident on Wolfe Island and a founding member of opposition group Wolfe Island Residents for the Environment, and Stephen Trude, a nonparticipating resident in Cohocton and president of opposition group Cohocton Wind Watch. The session was organized by groups of local citizens opposed to unregulated wind turbine placement, including the Wind Power Ethics Group in Cape Vincent and Concerned Residents of Hammond. More than 150 people attended the session at Thousand Islands High School. The three told stories of neighbors and residents who have difficulties because of seizure disorders, or developed anxiety attacks, learning disorders or other ailments after the turbines started turning. Cohocton Wind Farm has 50 turbines rated at 2.5 megawatts. One turbine was placed 1,500 feet behind Mr. Trude’s house, higher on a ridge. When the turbines started spinning in December, he began hearing and feeling that turbine and three others across a ridge in front of his house. Low-frequency noise creates a vibration he can feel in his chest, he said. He said he wakes up at least once a night and has to turn on the television to have some white noise to allow him to sleep. Noise measurements regularly hit 58 decibels at his property lines and 68 decibels at the property line of his neighbor, who is closer to another turbine. Cohocton’s zoning law is supposed to limit noise to 50 decibels at the property line and 45 decibels in a house. 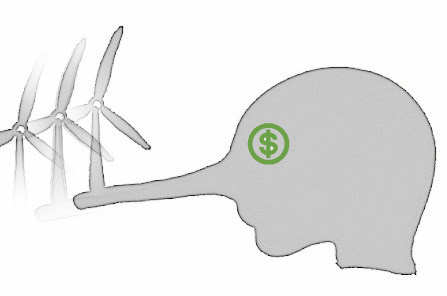 Despite the turbines spinning, Mr. Trude said, the wind farm is not selling into the grid. Cohocton Wind Farm, UPC Wind and First Wind are not listed as generators that sell into the grid on the Web site of the New York Independent System Operator, which operates the state’s electric grid system. Because of that, the town has not gotten its money yet, Mr. Trude said. Mr. Graham added that leaseholders also have not seen a cent. Mrs. Kenney, a 47-year resident of Wolfe Island, said the construction wreaked havoc on the island community. “You’re going to be affected one way or another even if it is just the change in your viewscape,” she said. During that project’s construction, she said, the problems included the number of workers, the amount of heavy equipment and need for additional fuel supplies, road damage, dust and air pollution, destruction of hedgerows, a 1,500-gallon oil spill and lengthening workdays to remain on schedule. “There’s definitely blasting involved in the construction, and we were told there wouldn’t be,” Mrs. Kenney said. Wolfe Island Wind Project is operated by Canadian Renewable Energy Corp., a subsidiary of Canadian Hydro Developers Inc., Calgary, Alberta. The developers used 2.3-megawatt turbines that are 410 feet tall with carbon blades 150 feet long. Now that the turbines are installed, she said, the lights are far brighter than residents expected. “We were told the lights would be the best, newest and softest of lights,” she said. The three implored the local residents to work with town officials to fight turbine installation or have stricter turbine zoning.